Foliar nematodes (also known as leaf and bud nematodes) affect over 250 plant species in 47 families. Aphelenchoides fragariae and A. ritzemabosi are among the most common species found in ornamentals. All foliar nematodes prefer moist conditions and moderate temperatures. They cause damage by direct feeding on the foliage. Because they destroy the aesthetic value of the plants, there is no acceptable level of infection. Strawberries, ferns, foliage plants, and vegetatively propagated potted ornamentals are important hosts. Reported ornamental hosts include Begonia species, Dahlia hybrids, African daisy, Pelargonium species, cineraria, primrose, zinnia, African violet, Hibiscus, Hydrangea, and Gloxinia. In general, foliar nematodes cause angular, vein limited chlorotic to brown to purple or black, water soaked lesions. 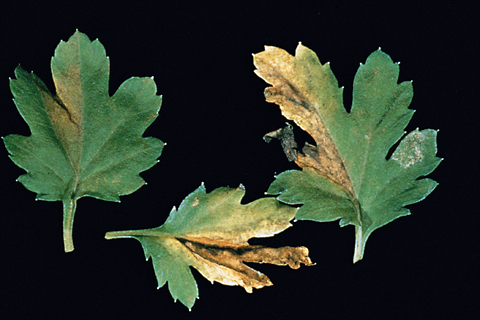 Lesion appearance can vary with light intensity, host plant, and the age of the lesion. Young leaves may exhibit distorted growth. 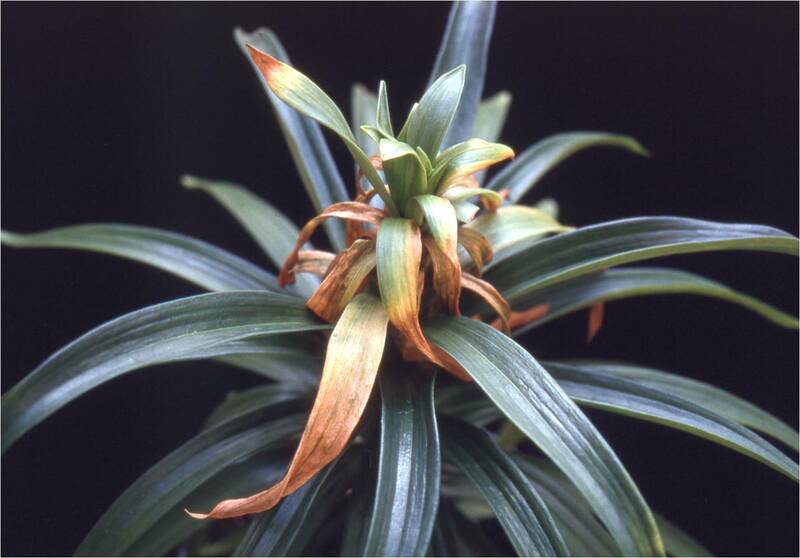 Affected leaves eventually shrivel, but often remain attached to the plant. 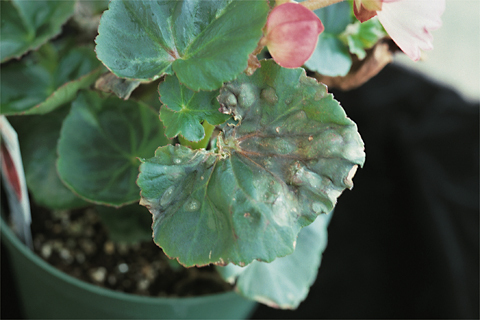 Symptomatic plants usually appear in randomly distributed “hot spots” in the greenhouse. 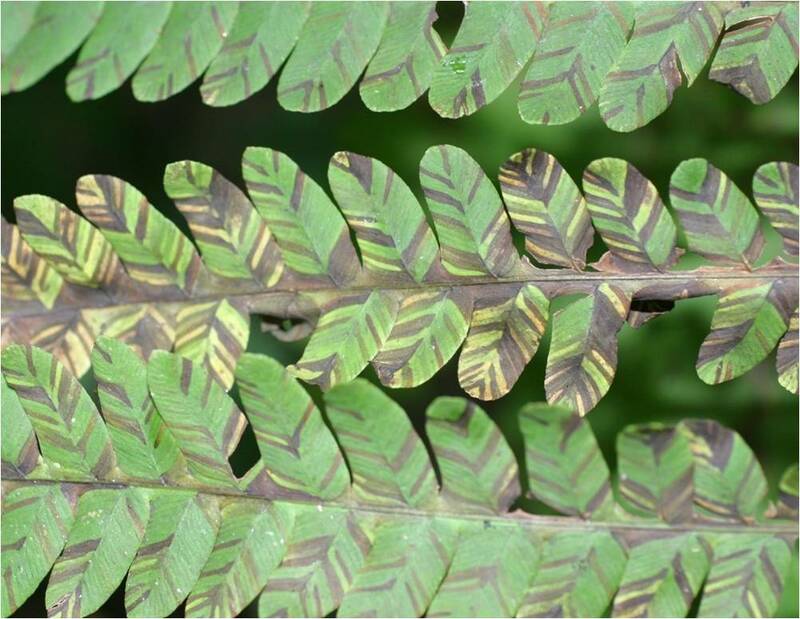 Association of foliar nematodes with fungal or bacterial pathogens can result in severe blight. Foliar nematodes can overwinter in the dormant buds of perennials and in plant debris in the soil. They can also persist in a dehydrated state in plant tissue for up to three years. The most likely source of infestation in greenhouse crops is infected but asymptomatic plants or cuttings. Foliar nematodes migrate by swimming up stems or along the surface of wet plant parts. Spread within a greenhouse is most often by splashing irrigation water. The nematodes enter the plant either through the stomates or by direct penetration. Once inside the leaf, they reproduce and cause damage by feeding on the leaf tissue. Their entire life cycle can be completed in less than 14 days at optimum temperatures (generally 65-75°F depending on species). Avoidance of infected cuttings, seedlings, or vegetative propagation material is the most important means of control. Inspect new plants carefully before allowing them into the greenhouse. Scout regularly for symptoms. Affected plants should be discarded. Many common weeds are hosts, so eradicate weeds within and adjacent to the greenhouse. Reduce the duration of leaf and stem wetness. Avoid overhead watering if possible. Water early in the day and space plants properly to allow foliage to dry quickly. Among chrysanthemums, the varieties ‘Amy Shoesmith’, ‘Orange Beauty,’ and ‘Orange Peach Blossom’ are known to be less susceptible to foliar nematodes. Hot water treatment for 5 minutes at 50˚C (122˚F) can eliminate foliar nematodes, but some plants may be injured by this process. Easter lily bulblets can be dipped in hot water at 52˚C (125˚F) for 10 minutes prior to planting. Hot water treatment must be performed very carefully because the potential for plant injury is high. There are no registered chemicals for control of foliar nematodes. M. Bess Dicklow, 2013; Revised by Angela Madeiras. Photos by R. Wick.